This Saturday it was finally time for some dyeing. We were 5 dyers: Bothild, Sigrid, Ulrika, Kjettil and myself, various husbands and children was also hanging around so we quite the crowd. The day started pretty early so we got lots of dyeing done! 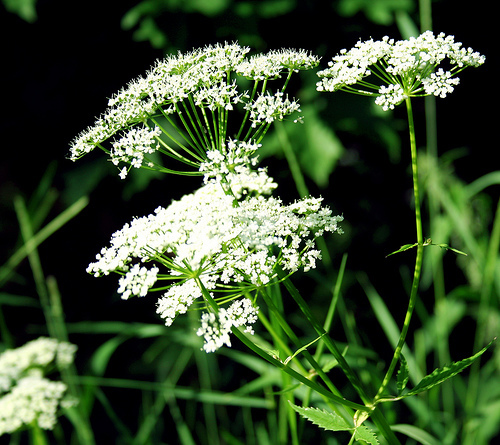 We ended up using walnuts, madder, cochineal, birch leaves, elderberry leaves and Kjettil also did some experimenting with both the roots of galium and the plant. Sigrid had prepared the cochineal in advance, crushing the scale insects and soaking them in water. We used 10 grams in 7 liters of water. Let it boil for 10 – 15 minutes and then cool to 90 °C. Put the damp wool in the cauldron in 1 hour making sure to stir and keep the temperature at 90 °C. 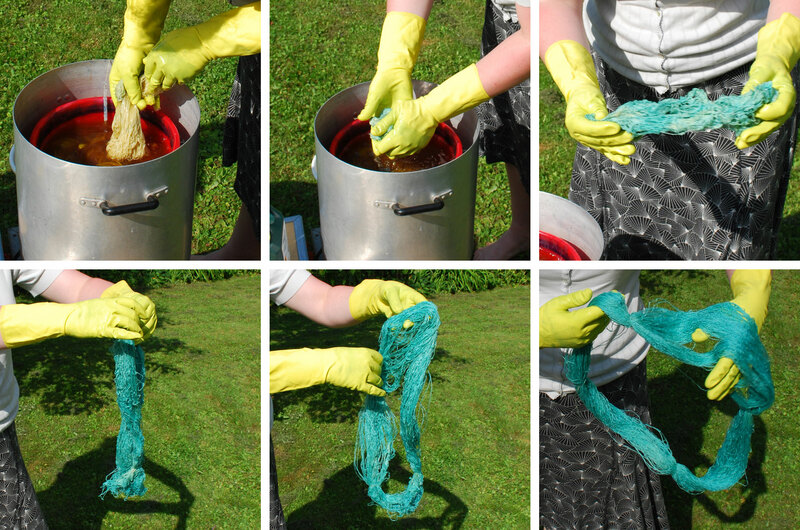 Pick up the wool and rinse it until the water is clear. We gathered lots of leaves and then let them boil for about 2 hours. The water was then cooled to 90 °C before we put the damp wool in. 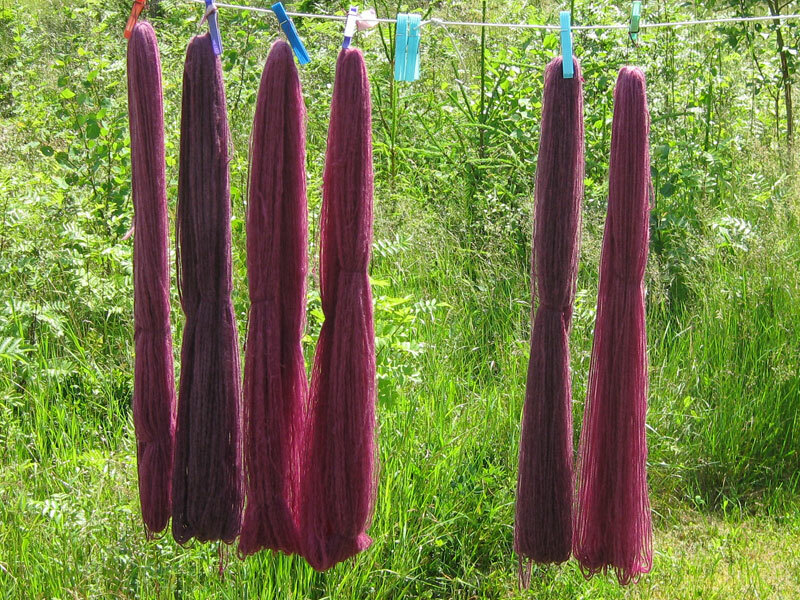 Then, as the usual method is with dyeing wool, we kept the temperature at 90 for and hour and stirred. 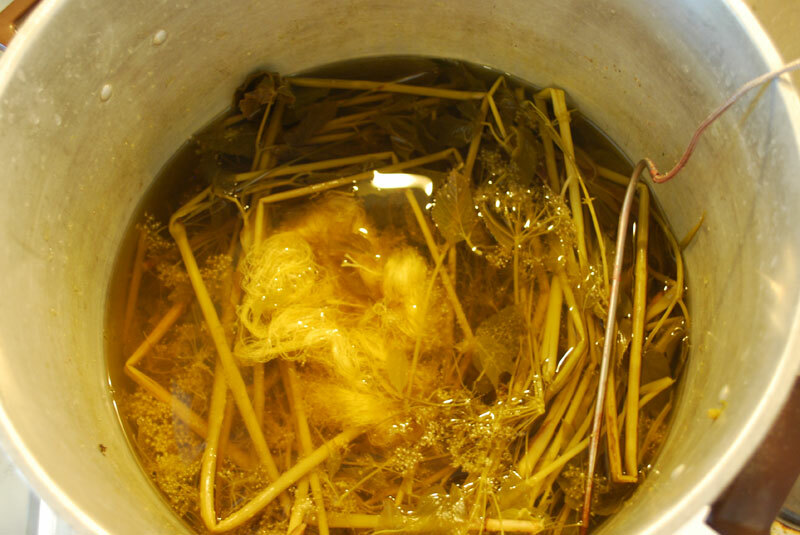 We let the wool cool in the water before picking it up and rinsing it. 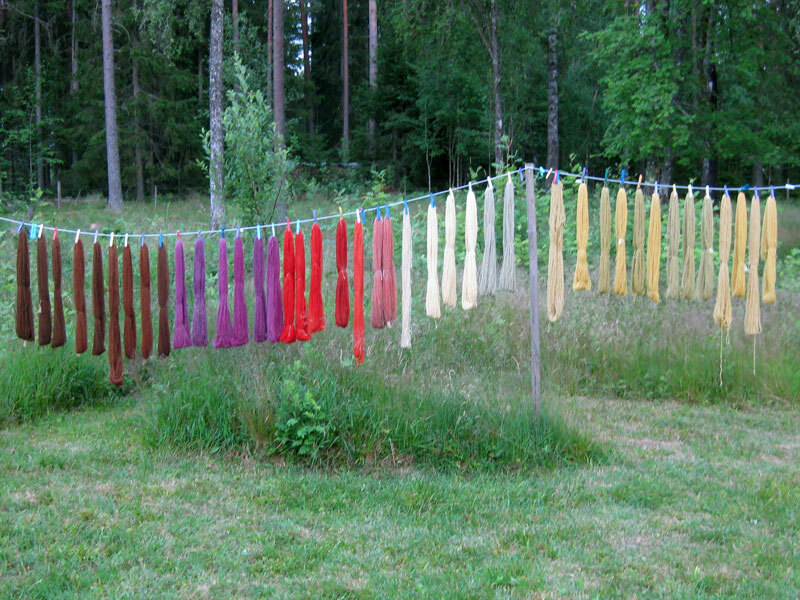 Wool dyed with birch leaves. We used both white and grey wool and with birch it really makes a difference. 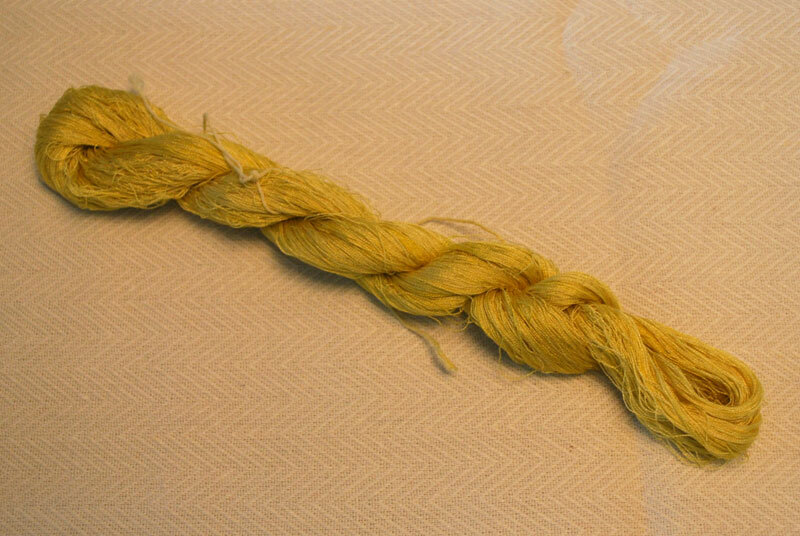 The white wool dyes yellow and the grey wool dyes green. 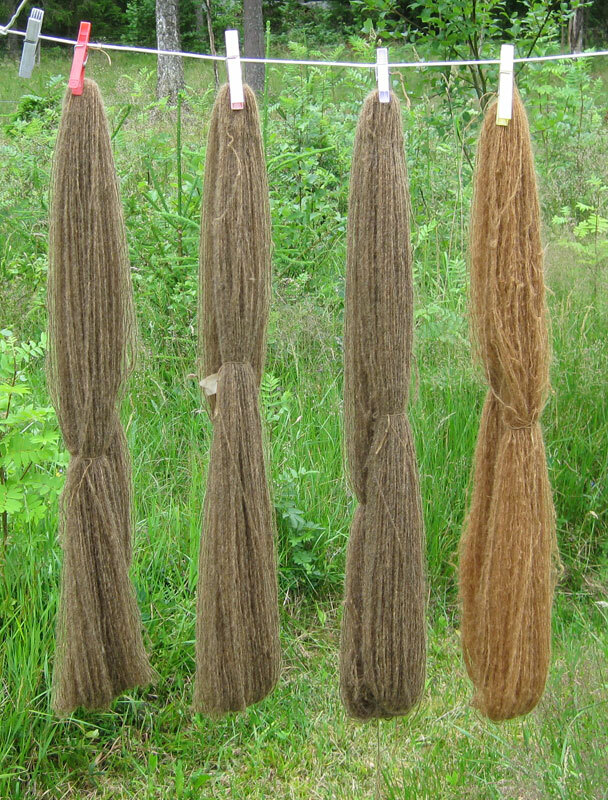 The dyeing with the elderberry was done with the same methods as the birch. According to sources it was suppose to give a nice green colour but it turned out more like a bland yellow-green colour. We probably didn’t pick enough leaves. 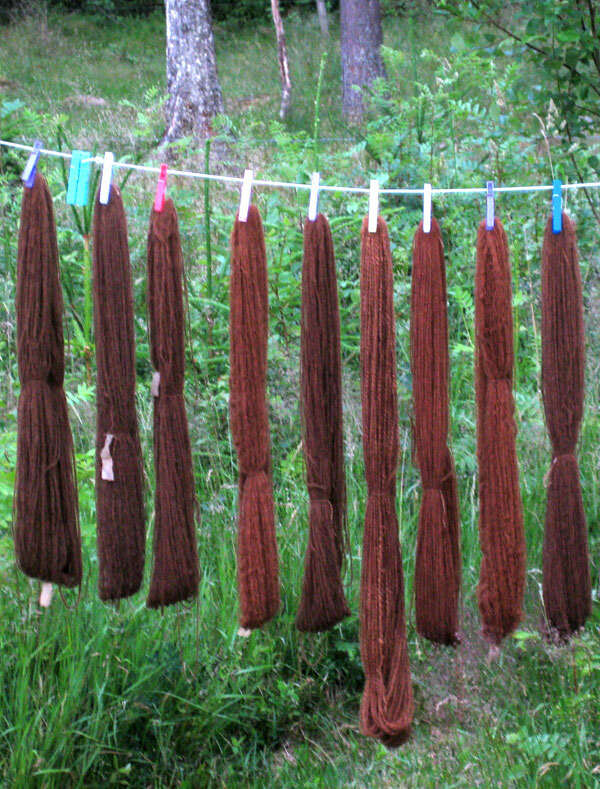 Wool dyed with elderberry leaves. 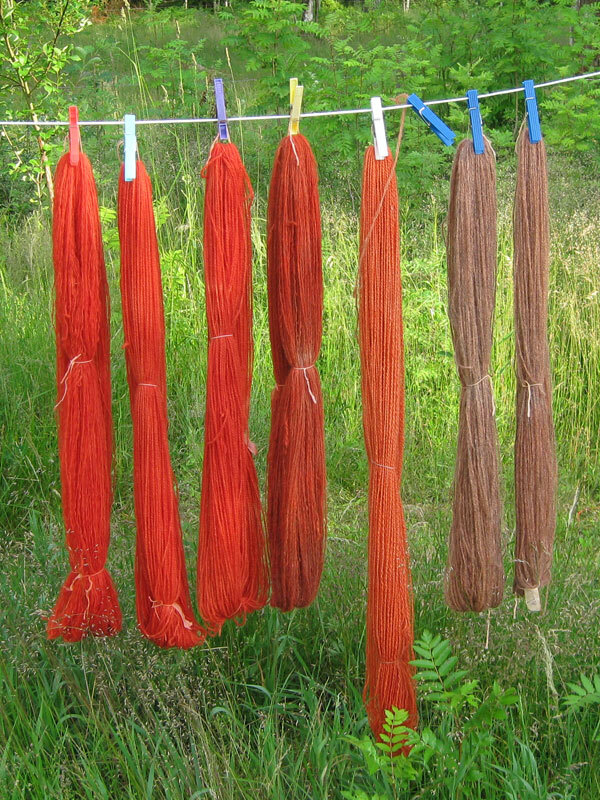 When dyeing with madder you use the root chopped in pieces (or preferably grounded) which has to soak in water at least over night. We used 100 grams of madder and 6 liters of water. It’s then heated to 70 °C and kept for an hour. If the madder reaches higher temperatures the colour will turn towards yellow and not nearly as beautiful. The damp wool is then added and kept at 70 °C for an hour. Don’t forget to stir. 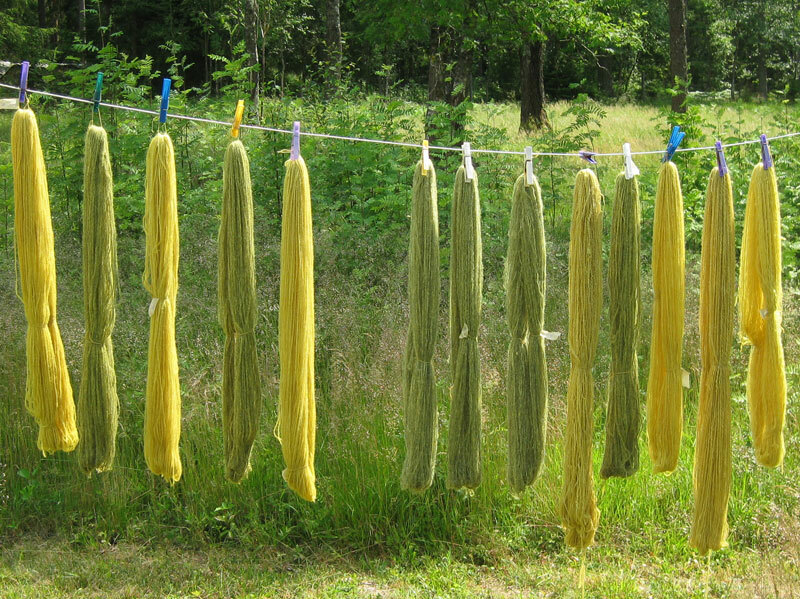 The two skeins to the right is from the second bath. It will still give colour but much less and not as bright. Skein number four from left is grey wool. We bought 1 kg of walnut shells that where already chopped (thankfully) and let them soak in water over night. 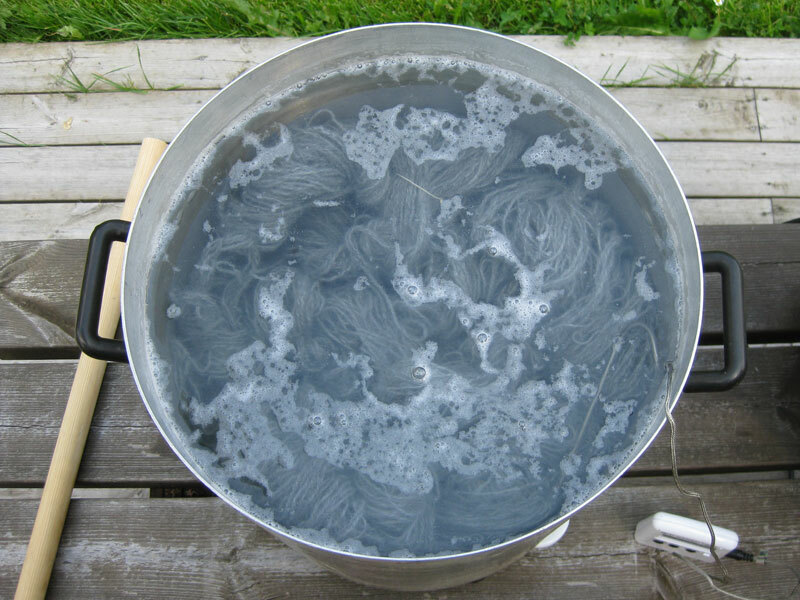 After boiling them in 15 liters of water we strained of the shells and were left with a deep brown water in which we put the damp wool. Left it there for 1 hour at 90 °C and then we rinsed it. We saved the water and used it the next day for some more wool. Wool dyed in walnut shells. A second bath with walnut shells. 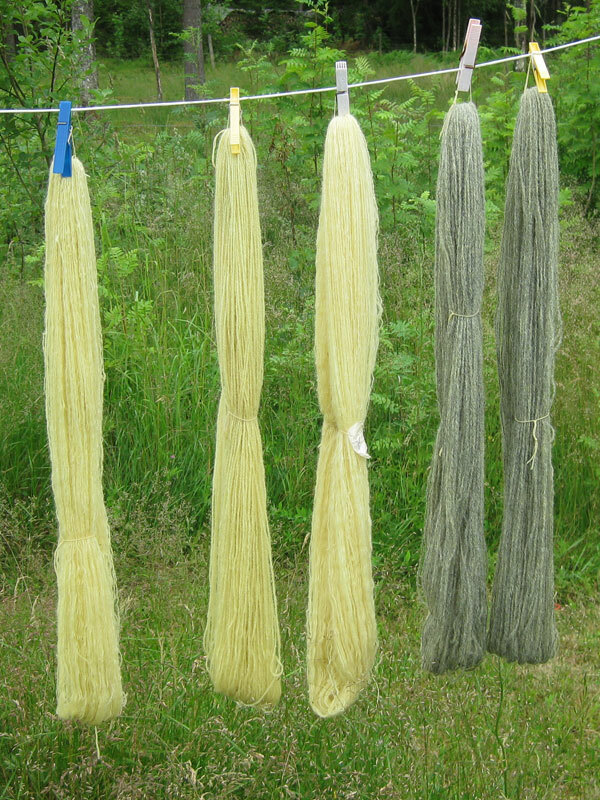 The skein to the right is white wool (and on coincidence matches my hair pretty good), the others are grey wool. We didn’t do any dyeing with the silk. You can’t do it together with the wool as the silk needs a cooler temperature but I’ll save it for a later day. 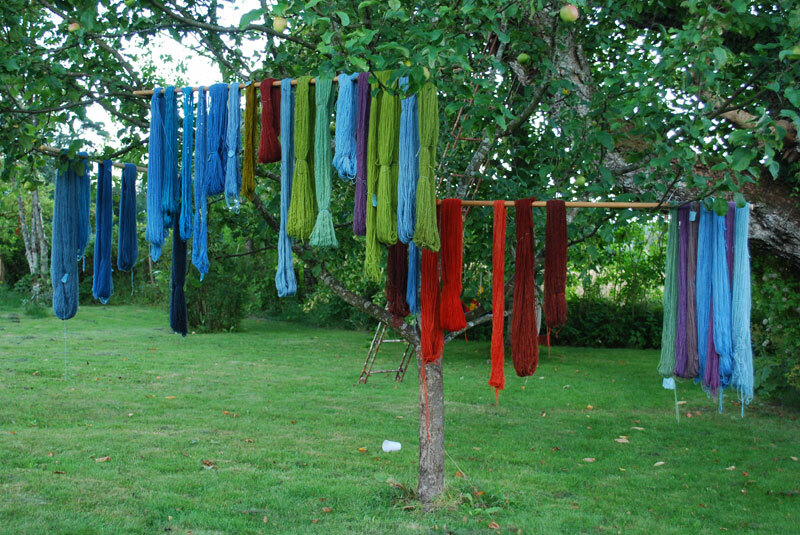 Also we had so much fun dyeing that we discussed another date for dyeing in August. Then we’ll focus on indigo and madder. 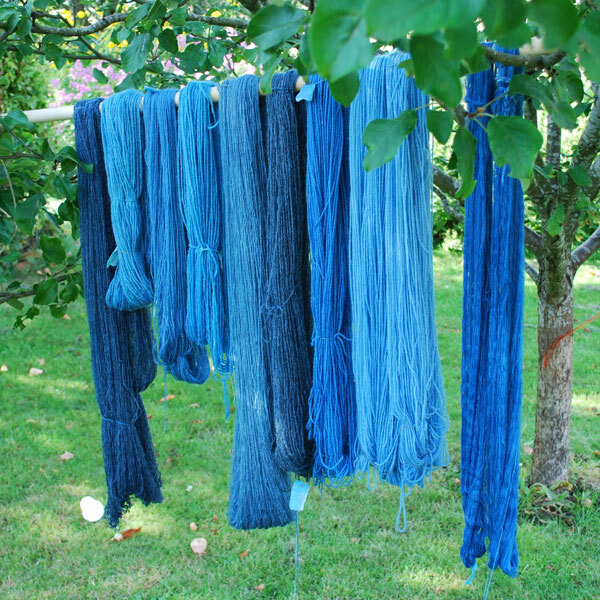 Today I’m pre-mordanting all the yarn with alum for tomorrows dyeing. With 2 kg of yarn it’s probably gonna take the better part of the day to get it all done. But it’s a lazy day so I don’t mind. I’m using a standard recipe with 20 gram alum to 100 gram wool in 5 liters of water. I heat the alum water to 60 °C and put in the wool. Then I heat the water to 90 °C and let the wool lay there for an hour. The wool will then cool in the water and then dried in the shadow.